While it’s mathematically possible to miss the finals, it won’t happen. Rest easy. Even if Port Adelaide defeats Essendon tonight, Geelong would have to lose to Gold Coast to miss out. As if. While it’s possible Port could win, the chances of the Suns winning at GMHBA Stadium tomorrow are about as much as there being cohesion in the Liberal party. Geelong will take care of business comfortably. In fact the main interest in this game is whether the Cats can get the ball to Tom Hawkins enough for him to win the Coleman Medal. Hawkins is one goal behind Lance Franklin, two behind Ben Brown and four goals behind leader Jack Riewoldt. It’s probable the big forward will boot a bag against the struggling Suns. Conversely it wouldn’t surprise to see North Melbourne try and get Brown over the line and with Richmond playing the Bulldogs, the Tiges might do the same for Riewoldt. 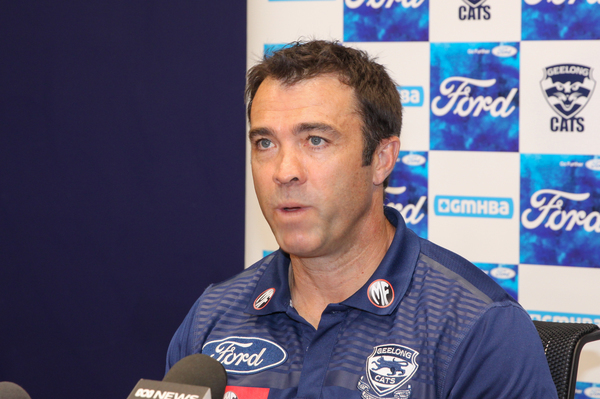 Coach Chris Scott extended his tenure at GMHBA Stadium during the week. Scott agreed to a long term contract extension that will see him at the helm until at least the end of the 2022 season. “Since I first walked in the door of the club, Geelong has been the only place I want to be,” Scott said. “The club provides the football department with everything we could possibly want, and we have an outstanding group of people working here to ensure we can be successful. Scott is already Geelong’s third-longest serving coach. Geelong can finish as high as seventh if they beat the Suns by around 50 points and Melbourne loses to GWS. The Cats’ most likely opponents in an elimination final are Hawthorn, Sydney (in Sydney) or Melbourne. This game will be Gary Ablett’s second against his old side and his first against them in Geelong. The Cats and Suns have met four times at GMHBA Stadium, the Cats winning all four by an average of 83 points. We don’t see envisage it being much different tomorrow. The Suns have won just three final terms all season. It all points to a very ugly last quarter with Geelong winning seven last quarters in a row.